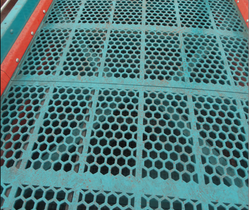 We know that you have been purchasing Traditional Wire Mesh Screens for screening your crushed products.We would like to introduce HIGH WEAR RESISTANCE SCREENS MADE OF ABREX 500"LT" THE TOUGHEST MATERIAL AVAILABLE IN THE MARKET. Introducing "LEOSCREENS" multi deck screening solutions. Abrex plates are used in the Liners of the Crushers, Liners of hoppers and Where ever there is heavy Impact and Heavy wear and tear of the material.We know that you'll might be using these plates for liners of your applications to avoid heavy loss due to break down of the Wire Mesh Screens, so why not break the Monotony and start using Abrex 500 "LT" Screens to avoid regular break downs of the VIBRATING SCREENS. 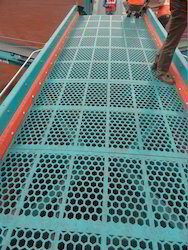 These Vibrating Screens are made from Abrex 500LT plates of having minimum 500 BHN plates. and having very high abraision resistance properties against traditional Steel wires.Maximum Hardness a wire can attain is 300 BHN and that also in working conditions and these plates are by default 500 BHN so it will give you the best life as required by you. Majority of the customers are using ABREX 500 'LT" TOP DECK AND MIDDLE DECK SCREENS MADE FOR BEST RESULTS.Wire Mesh will not give you the desired life. Looking for Crusher Spare Parts ?